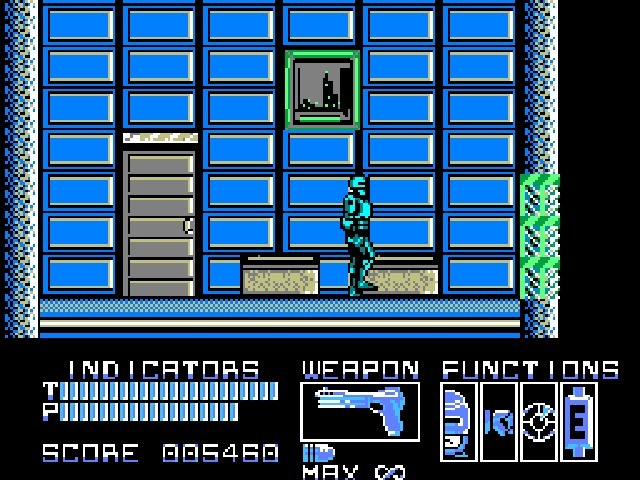 Robocop is another translation from an arcade game based on a movie. You play through various levels following along with the movie as the bionic officer takes down thugs, saves hostages, and tracks down those responsible for his violent creation. 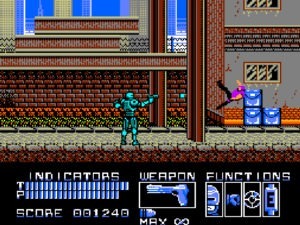 The game Robocop has you heading through various levels of Detroit and following along with the movie’s plotline. Numbers of enemies will chase and attack you, and you will either punch them or blast away with your weapons. At the end of the levels, you will fight a boss. Between some levels there is a mini-game where you shoot at targets to earn energy and lives, but there’s not any variation beyond that. Robocop follows a classic formula, so what’s important is to see if it works. Keen Robo-senses point out a hidden passage. 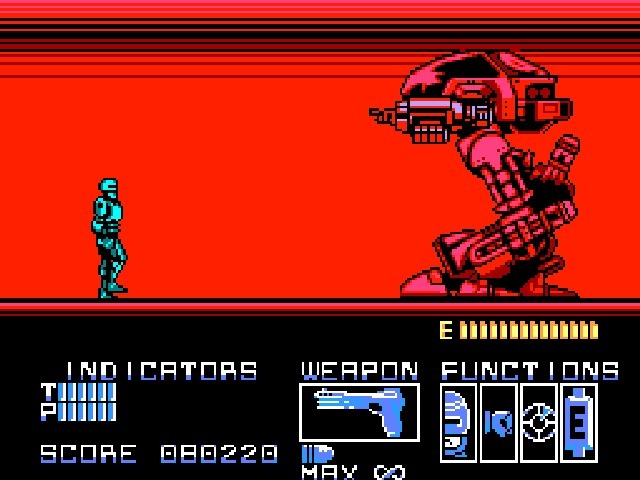 The game actually does a respectable job of representing Robocop. Your on-screen persona strides with mechanical confidence and blasts away thugs. Three different weapons are available, but most important is the inclusion of Robo’s signature gun that proves both effective and satisfying to use against the provided assortment of villains. A series of indicators will monitor your surroundings and flash and beep when information needs to be given, pointing out hidden passageways, the proximity of mission goals, enemies that cannot be defeated with bullets and more. It adds a feeling of authenticity to the game and helps to set it aside from playing as just another guy with a gun. Critics of the game complain that you do not always have access to your pistol and that the ability to jump, which is a platform staple, is not in this game. But these features actually add to the role. Would a 6’2″ robot made of titanium and various mechanics really be able to jump? Pretty doubtful, but even so it’s refreshing not to have another platform game where you must make a series of precision jumps every few minutes. On the gun issue, Robocop puts his gun away when he is facing a section of unarmed enemies and retrieves it when he is up against enemies with weapons. Once again, authenticity, but enemies die just as quickly from fists as they do from bullets, so it offers some forced variety to the gameplay without ever making things unfair. Robocop lays down the law. The biggest flaw of the game is that you are timed through Robocop’s internal energy, which is constantly depleting itself. When the energy bar runs out, Robo shuts down. Though this time can be extended by picking up batteries, such powerups are quite rare, especially in the later levels when you need them the most. The last level is full of enemies and totally devoid of batteries, so it’s a difficult challenge just staying operational long enough to get to the end. A second flaw is that Robocop, who supposedly cannot be killed by conventional weapons, takes significant damage from dogs, punches, and flying kicks. Huhwha? How and or why is this possible? Also, it is rare to have guns fired at you but they cause massive damage if they connect. Life powerups are available and in much greater numbers than the batteries, but it doesn’t really explain why you’re so fragile, and doesn’t really help you to feel like the walking tank Robocop is supposed to be. The graphics in the game are sharp and clear enough to get the job done. Some death animations seem surprisingly graphic for the NES, such terrorist holding the mayor hostage, and his acrobatic death upon being defeated. Other than that, there’s not much else worth mentioning. The sound is a highlight of the game. Robo’s pistol, for example, sounds as close to its movie counterpart as it can get. The massive ED-209 rumbles when it walks and growls angrily, dogs bark and yipe when they get killed. There are only two themes in the game, but both are based off of music in the movie. They are fair conversions, and even though the same music is used though all the levels, it is decent enough not to call attention to itself and be annoying. The controls perform well enough, with turning and shooting being quite responsive. Climbing or stairs is a painful chore however, and you’ll spend a lot of time trying to find that one area that will register “down” as descending stairs instead of ducking. It’s a noticeable flaw, but one that rarely comes up. 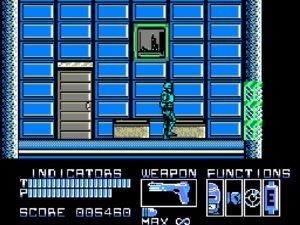 Robocop does a decent job of delivering the gameplay. There are enough features to make it clear you’re playing as the mechanical cop instead of just another platform game character. It’s fairly short, taking maybe 30 minutes to beat at the most, but an entertaining experience while it lasts. It’s worth playing through once but there’s certainly no reason to give it another thought afterward unless you are an avid Robocop fan. Fairly repetitive, damage and time limit are annoying.